The Morgan is a kaleidoscope of colour, featuring mixed flowers creatively arranged with flair and panache. The only arrangement of ours to feature sultry lilac roses, the Morgan also boasts a vivid swirl of orange alstromeria, fiery red gerberas, sunshine yellow Asiatic lilies, lemon yellow chrysanthemums, and inky purple irises. 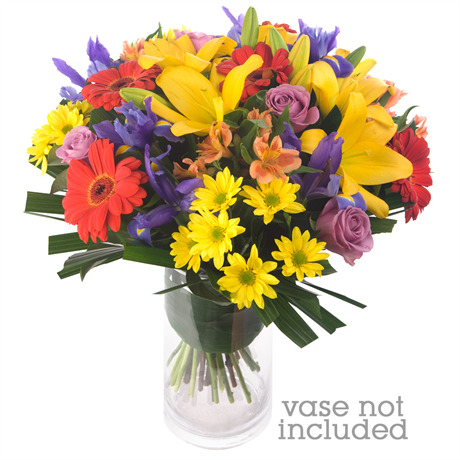 This rainbow of stems comes beautifully blended in an impressive bouquet, and is complemented by lush greenery. Show your appreciation with this bright and exuberant expression of gratitude that has been designed to evoke joy. Nothing quite compares to receiving a bunch of surprise flowers, so surprise them- they deserve it.